Engineered for precise distribution of nitrous and fuel for all domestic and foreign carbureted/EFI 4, 6, 8 cyl. & Rotary engines. 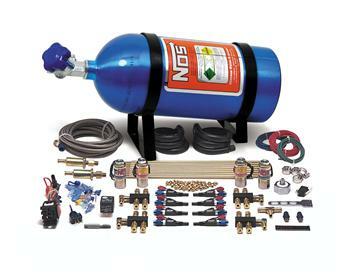 The NOS Sportsman Fogger Systems offer superior atomization and tuning by injecting precisely measured amounts of fuel and nitrous into each individual port with our patented Fogger Nozzles. Power levels are adjustable by changing nitrous and fuel jets in each Fogger Nozzle. The latest in high-tech solenoid technology allows for an extreme degree of reliability with jetting adjustability ranging from a 50 to a 150 extra HP gain. All Sportsman Fogger Systems include a 10 lb. capacity nitrous bottle, Powershot nitrous and fuel solenoids, Fogger nozzles, aircraft quality steel braided hose, and all other necessary electrical and mounting hardware for a complete installation. Requires removal of intake manifold for plumbing.